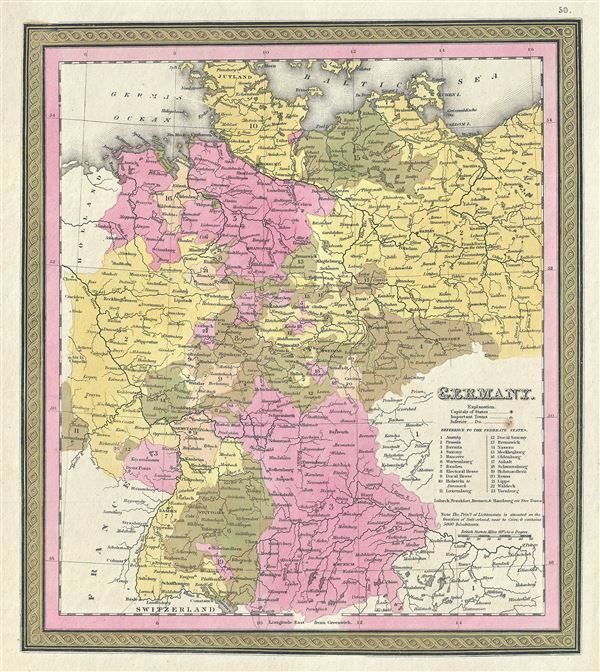 This is a fine example of S. A. Mitchell's 1846 map of Germany. The whole is engraved in Mitchell's distinctive style with green border work and vivid pastels. Political and topographical features are noted and color coded with elevation rendered by hachure. The map is color coded according to German Federal States with a key referencing the same along the right border. This map was prepared by S. A. Mitchell for publication as plate no. 50 in the 1846 edition of Mitchell's New General Atlas. Mitchell Jr., S. A., Mitchell's New General Atlas, Containing Maps Of The Various Countries Of The World, Plans Of Cities, Etc. Embraced In Forty-Seven Quarto Maps, Forming A Series Of Seventy-Six Maps And Plans, Together With Valuable Statistical Tables, 1846 edition. Rumsey 0537.051. Phillips (Atlases) 6103-50.